Rosemary, which has the scientific name Rosmarinus officinalis (from the Latin word ros meaning “dew” and marinus meaning “sea” — “seadew”), is a sweet-smelling evergreen herb that originated in the Mediterranean and is used as culinary condiments (in rosemary chicken or lamb) or as perfume. It belongs to the mint family Lamiaceae, along with other herbs such as basil, lavender, oregano, and thyme. Even though it is a member of the mint family, rosemary doesn’t have its co-members’ distinct aroma, and has instead a warmer and more bitter flavor that makes it perfect for roasts, sauces, soups, stews, and stuffing. Rosemary is a staple in Italian cuisine. The perennial rosemary can be characterized by its leaves, which resemble flat pine-tree needles in that they are colored deep green on top and silver-white on their underside. A study that was published in Therapeutic Advances in Psychopharmacology showed that the smell of rosemary can instantly boost a person’s accuracy, performance, concentration, and speed levels. It is considered a cognitive stimulant, causing people who regularly ingest it to improve their focus. Rosemary can be beneficial for people who have suffered a stroke as it hinders the onset of brain damage and can help a person recover faster from this neural ailment. Rosemary can also delay brain aging, and is a powerful tool to combat Alzheimer’s disease or dementia. It was also said to influence a person’s disposition. It has been studied to relieve stress in people who are suffering from chronic anxiety or hormone imbalances. Studies that were recorded in Oncology Reports; Bioscience, Biotechnology and Biochemistry; and Journal of Food Science all attested to the fact that rosemary can prevent cancer. According to the studies, it can “slow the spread of human leukemia and breast carcinoma cells”, prevent the growth of tumors, and generally hinder the formation of cancer-causing agents, respectively. Rosemary is also effective for maintaining good eyesight. As a matter of fact, Dr. Stuart A. Lipton and his colleagues at Sanford-Burnham Medical Research Institute revealed in their study that was published in Investigative Ophthalmology & Visual Science that carnosic acid, which can be found in rosemary, can prevent diseases that affect the outer retina, such as macular degeneration. Speaking of carnosic acid, it can also lessen inflammation of blood vessels, joints, and muscles. It is also used to treat arthritis, blood pressure, gout, and injuries that have been incurred during major surgeries. Rosemary is good for deterring bacterial infections, especially those that target the stomach. Stomach-related issues, such as bloating, constipation, diarrhea, and stomach upsets, can also be addressed by ingesting food with rosemary. Rosemary also takes care of your oral health. It can act as a natural breath freshener. Just submerge it in hot water, gargle, and you can be assured of having fresh breath for around eight hours or so. Rosemary can be applied topically to cure wounds. Its analgesic properties are also perfect for seeking relief from pain that is caused by headaches and migraines. Being a diuretic, rosemary has the capability of flushing out toxins such as pathogens and salts, and even excess fat, when you urinate. Regular ingestion of rosemary can also contribute to a younger you. Its anti-aging properties can help you get rid of blemishes and increase your hair’s natural shine. Rosemary, which is chock-full of antioxidants, is good for the immune and circulatory systems, as it protects the body from diseases and improves blood circulation by boosting red blood cell production and blood flow, respectively. Adding rosemary to your weekly diet can help your gastrointestinal system by regulating your bowel movements. Rosemary also stimulates the oxygenation of vital organ systems to ensure that they are running smoothly, and repair cell damage. Ingesting rosemary is good for your cardiovacular system as it improves heart health and prevents atherosclerosis. For suggestions on rosemary recipes, visit this link. Rosemary takes care of your oral health. 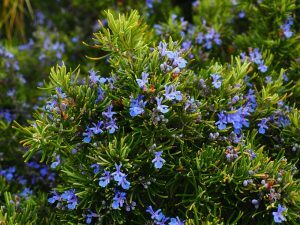 Rosemary can be applied topically to cure wounds. Regular ingestion of rosemary can also contribute to a younger you.